The "Muristan", the area south of the Holy Sepulchre, where in the Middle Ages the hospital of St John stood and where today the Church of the Redeemer stands, lay, in the 19th century, in ruins and became the site of archaeological excavations. The Napoleon Bonaparte’s campaign to Egypt in the years 1798/99 had revealed the weakness of the Ottoman Empire and directed attention in Europe to the Orient. The scholars who accompanied Napoleon explored Egypt and founded the Institut d'Egypte, which became a nucleus of Egyptology. This resulted in an increased interest of European scholars in the study of the culture of the Middle East, including that of Palestine. In many cases, one hoped to be able to confirm biblical reports through archaeological excavations. Jesus' life and the question of the authenticity of the Holy Sepulchre were the main foci of the evolving field of biblical archaeology in Jerusalem. The main aim of the work was to search for the "Second City Wall" of Jerusalem from the time of Herod the Great (37 to 4 BC) described by the Jewish writer Flavius Josephus in the 1st century AD, and thus the question of the correctness of the location of Jesus’ crucifixion site (Calvary) and the tomb. According to Roman and Jewish custom at the time of Jesus this had to be outside the town. It was hoped that excavations in the Muristan would contribute new knowledge. During construction of the Church of the Redeemer in 1893 a large wall was discovered running in an east-west direction, seemingly the "Second City Wall" and with it the proof of the authenticity of the holy places in the Church of the Holy Sepulchre. 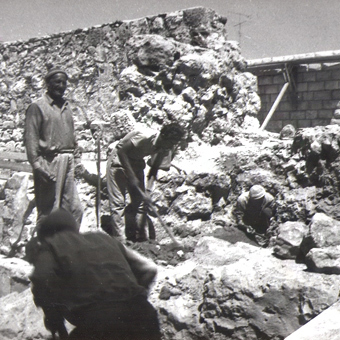 During restoration work at the Church of the Redeemer from 1970 to 1974, the German Protestant Institute of Archaeology under its then-director Dr. Ute Wagner-Lux conducted excavations to secure archaeological evidence. A sounding disproved the assumption that the great wall of the Church of the Redeemer was a section of the "Second City Wall". The sounding led to a quarry, on which at the turn of the millennium earth was deposited and which was used as a garden. Thus it was proved that the terrain and therefore the place of today's Holy Sepulchre had been outside the city at the time of Jesus. The "Second City Wall" is still a mystery, because as yet no-one has found any of its remains. The findings of the GPIA and other excavations suggest that it must have run to the east of the "Muristan" towards the north. The opinions of archaeologists differ on its further extent. The exhibition explores the beginnings of archeology in Jerusalem, and shows using the original plans the approach taken by the researchers of the 19th century in their excavations in the Muristan. Photographs and drawings document the work and the results of the excavations of the GPIA at the Church of the Redeemer and the cloister in the 1970s. Maps illustrate the current theories as to the location of the "Second City Wall" of Jerusalem, which have received a decisive boost in the GPIA findings.